Checking the online encyclopedia Wikipedia does not give an answer (the page does not exist!). Still in Cultural Awareness Training, it is a real important issue. How do you manage internationally and/or how do you manage expectations of other people when working Internationally? From an Organizational Psychological standpoint one could argue that to get the most out of people you manage, you manage them according to the way they want to be managed. This may sound as common sense, but is certainly not common practice. Typically not when working with different cultures. Typically when the (work) pressure goes up, people have a tendency to revert back to their own “default” cultural behavior. Mr. André Laurent (INSEAD) has done some real interesting research on this subject. Have a look at the table below. 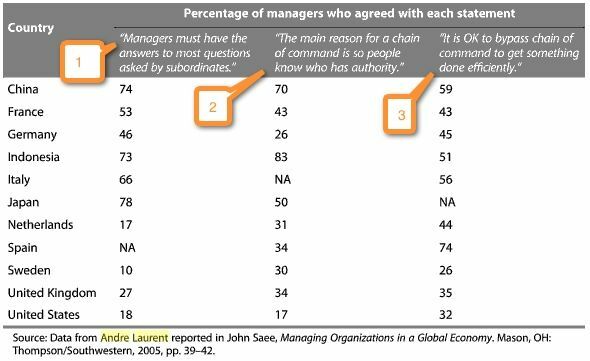 “Managers must have the answers to most questions asked by subordinates“, followed by a number of countries, with percentages of managers in agreement with the statement. Let’s compare China with Sweden. China 74% of the managers in agreement; Sweden 10% in agreement. In Sweden, if a manager does not know the answer to a question, (s)he can “easily” say “I don’t know”, and the person asking the question will not mind. In China, the expectation of subordinates is much different than in Sweden. Subordinates being sent away with an “I don’t know” answer will quickly loose trust in their manager. Their manager is just not credible, because as a manager you should “know”. “The main reason for a chain of command is so people know who has authority.” Again, looking at China & Sweden, you can see the same trend. China scores relatively high on Hofstede’s dimension Power Distance, while Sweden scores on the low end. Which is a good explanation for the differences between these two countries. In higher scoring countries (e.g. China) you want to see who is in control: the Boss. While in Sweden (low score on Power Distance), who is in control is much less important. “It’s OK to bypass chain of command to get something done efficiently.” Here you can see the opposite. In China people feel it is OK to bypass the chain of command. The reason for this is, from a subordinate’s point of view, the boss is not always right. And to get things done, you need to do them either yourself, or get them done through a back door. While in Sweden, subordinates are not as likely to break the chain of command. Typically they don’t have to because they have delegated authority anyways. And if they don’t, well… you just do what your boss tells you to do (at his or her risk, not yours). What is crucial to understand here (going back to something said already) is that people want to be managed the way they want (or rather expect) to be managed. If you’re a Swede, working in China, you better know all the answers that you’re asked. If you’re Chinese, managing in Sweden, you don’t need to know everything. Plus as a Chinese manager, it makes sense to give your subordinates a greater (greater than in China) range of freedom and delegated authority. What is your experience when managing in other Cultures? thank for this illuminating article. But I would find it hard to explain in a training session to westerners, why in China they would feel it alright to bypass the chain of command to get something done (given the power distance between boss and subordinate) unless this was done with the implicit knowledge/consent of boss who needs to maintain his authority/reputation so can’t ‘get his own hands dirty’. I remember a case study I did once where an expat marketing officer in China discovered a production defect affecting an imminent shipment, tried to inform her boss to inform the production mgr (both on same level) to try to rectify the defect before shipping off, her boss was on leave so she took it upon herself to contact the production mgr directly but was rebuked for having crossed lines of command ……… the production mgr expected to be informed by someone at his own level in the hierarcy etc. Thanks for your comment. And I must say I agree with you that this is an awkward finding from this study. I also agree that under “normal” circumstances Chinese workers will not bypass their boss. The only rational explanation I can give for this is that the statement talks about doing something “efficient”. It could be that if the boss is incompetent and engaged with his own career, he does not pay enough attention to his workers. This could lead to demotivation of the subordinate, leading to him or her taking own initiative (to possibly climb the hierarchical ladder). Remember that in high scoring Power Distance countries the Boss is Accepted, but not always Respected. In your case study, could it be that Collectivism plays a role as well; Workers belong to one group, while Management belongs to another (In-group versus Out-group)? I’m having trouble understanding column 3 as well. Could it be that the score is based on the % who “disagree” NOT “agree” with the statement. I’ve read some other interpretation of this result and they read the % as disagreement. This would make more sense. As i don’t believe hierarchical organisations & cultures will by pass their boss. Would be interested to get your thoughts on that. Yes, the third column is confusing to understand. And also for me it does not make 100% sense. The danger lies in interpreting too much (left right and center) just to make the numbers make sense. That would not be right either. The numbers in the 3rd column seem to inversely correlate with Power Distance.